Initial C: Monks Singing. MS. 24, Leaf 3V. Unknown artist, Italian, circa 1420. Tempera colors, gold leaf, and ink on parchment. Picture a dimly lit church. The scent of incense is in the air, and you hear the sound of chanting. Choristers are clustered in a corner, performing a call and response with one of the monks. In front of them is a lectern, and on top of it is a huge book. It is big enough that they all can read it at the same time. Now swing around behind them and look at the book. It has large notes, and shows the words being sung. It most likely has illuminated drawings on it, and if it is an especially fine specimen, it will have a large illuminated initial. Close-up of monks from above image. Choirs were an integral part of medieval worship. 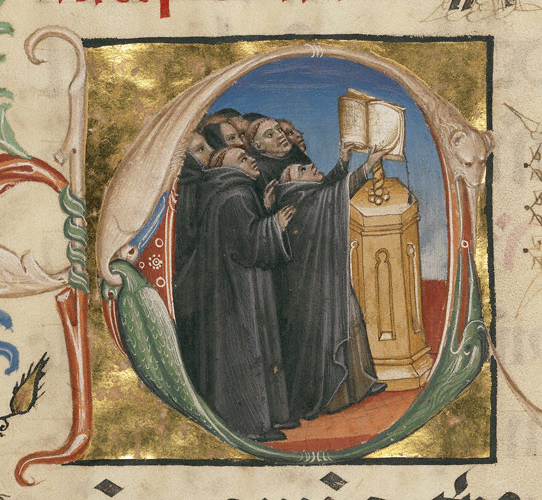 Since books were expensive it wasn’t possible for each member of the choir to have their own. So very large books were made, some beautifully embellished with initials, drawings, borders, and other decorations. The entire choir was able to read and sing from the one book. Tempera colors and gold leaf on parchment. The books were made by hand, written by a scribe or calligrapher on parchment or vellum. Their production usually required a team of craftsmen working under a master. Some were made in scriptoriums, others in artisan workshops. 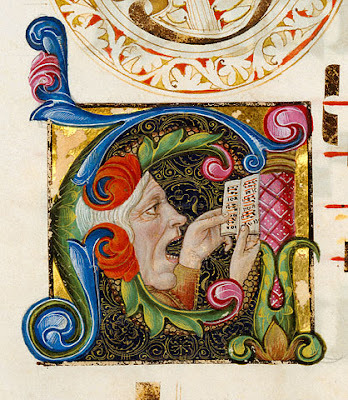 An illuminator was an artist who decorated the book. A binder then sewed the sheets together into a book and placed them within a cover. 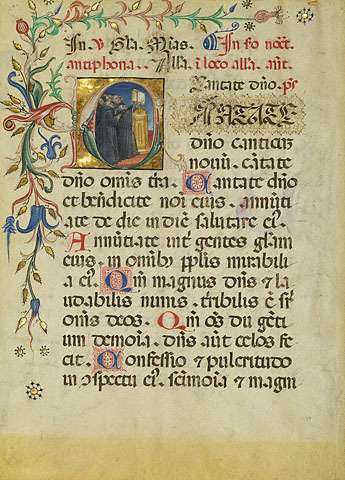 The production of a book was commissioned and financed by a patron, sometimes the head of a monastery or cathedral. gold leaf, and ink on parchment. 18-5/16" x 13-5/8"
Musical chants were an important part of ritual ceremonies. One of these was the Mass, a public ceremony that included the blessing of wine and bread to be consumed. Missals, which contained the spoken prayers and chants that priests performed during Mass, were small and portable. 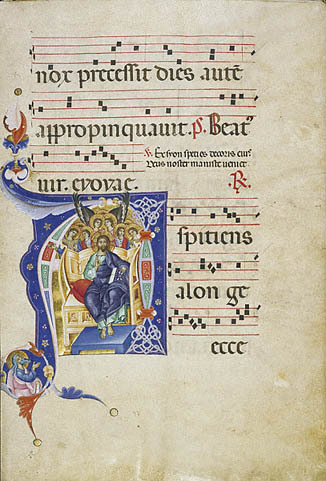 Graduals, containing music and text sung during the year for Mass, became larger as choirs grew in size. Artist unknown, Italian, circa 1460-1480. The Divine Office is a cycle of prayers that are recited each day at prescribed hours. One of the books used for these is an antiphon. An antiphon is usually in Gregorian chant, and is a response by a choir or congregation to a text, most often a psalm. Antiphons are still integral in Greek Orthodox and Eastern Catholic churches. Master of Gerona, Italian, 1275-1299. 22-15/16" x 15-13/16"
From an antiphonal; sung on the first Sunday in Advent. 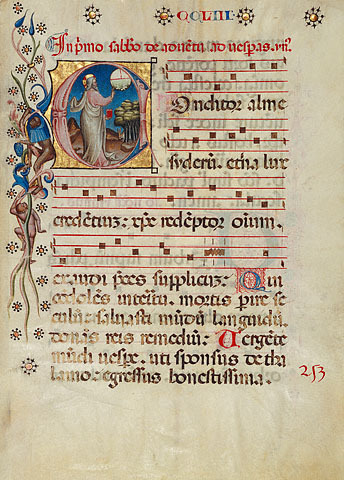 Depending on the age of the book, the musical notation may be in neumes or in square notation. Neumes are a series of ascending and descending dots and lines. A neume was a symbol that could signify two to four notes. Readers could get a sense of the melody and how long each word should be sung with this notation. 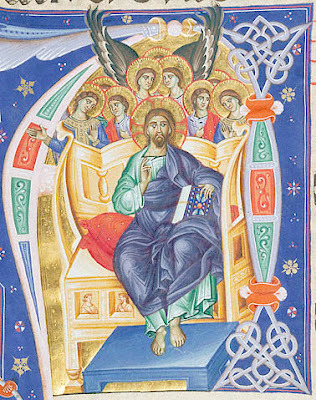 From a page of the Stammheim Missal, German, circa 1170s. The word neumes comes from the Greek word for gestures. They were placed without staffs. 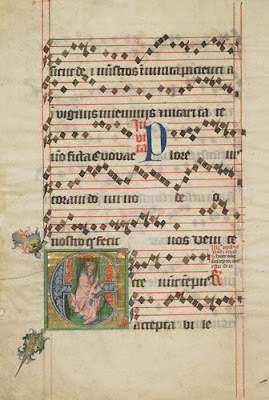 Since most singers knew the songs by heart, the neumes served as a reminder of the rises and falls of the melody being sung. So in essence they were a type of shorthand or mnemonic for the melody of a chant. From a page of a gradual, Italian, circa late 1400s or early 1500s. Square notation used a four-line staff with clef notes. Groups of ascending notes were squares, stacked, and read from bottom to top. Descending notes (sometimes diamonds) were read from left to right. Square notation became the standard, and is the precursor to the modern notation used today. and gold paint on parchment. 22-3/8" x 15-13/16"
Many of these religious volumes are difficult to read, due to the lettering style and the abbreviations. Although printed books were introduced in the mid-fifteenth century, the production of handmade books continued for approximately another century. Illuminator known as the Master of Gerona. MS. LUDWIG VI 6.
ink on parchment. 22-15/16" x 15-13/16"
The illuminated initial usually came at the beginning of a passage or a paragraph. These letters were both a source of beauty and served to help the choir to find their place. (Remember those dimly lit churches!) It was common for a “V” to be written as a “U”, and vice versa. 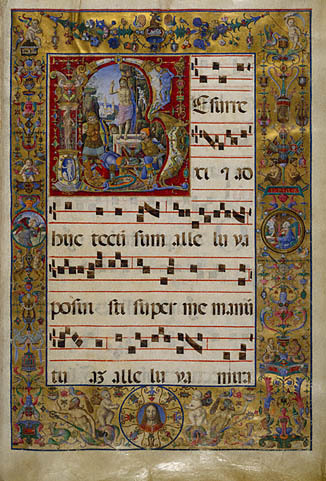 Close-up from a page from a gradual illuminated by Antonio da Monza. 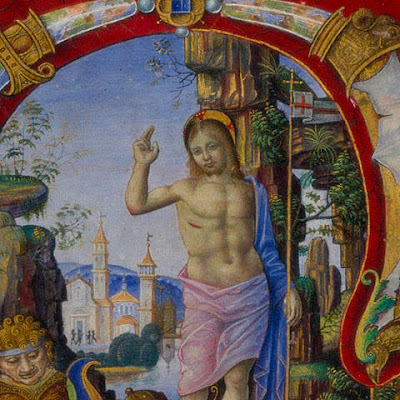 Italian, late 1400s or early 1500s. MS. LUDWIG VI 3. Tempura colors, gold leaf and ink on parchment. 25-5/16" x 17-1/8". These beautiful volumes were made and used in Europe beginning around 500 C.E., and in some areas their use continued into the early part of the 20th century. They serve as historical documents revealing to us the songs that were sung, the production methods of books, and many of the illustrations provide a glimpse into the life of their respective eras. A rare chance to relive an ancient past.